The more we engage with customers the more we see patterns in their search behaviour repeated across firms – and across countries. One emergent pattern is that searches initially populate a workspace with information that is then reviewed, cross-checked and distilled down to a valuable sub-set. In some cases the volume of information initially retrieved with each iteration of the search and review process can be unwieldy. Our job is to make our customers as productive as they can be in this winnowing process and that’s why filters are the focus of our July release. While Encompass has always supported filtering, this month we have redesigned things to provide a set of pre-defined handy filters through a new panel. This makes the filtering experience far more intuitive and reduces the time taken to review and distill information. 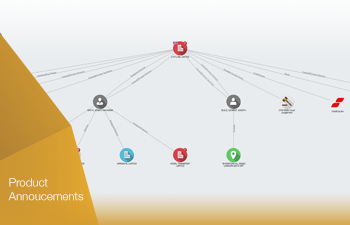 Additionally, once you’ve set one or more filters in a workspace they persist and continue to apply to all information brought into that workspace, allowing you to control which entities are excluded from view as you retrieve further reports and enrich your chart with additional data. 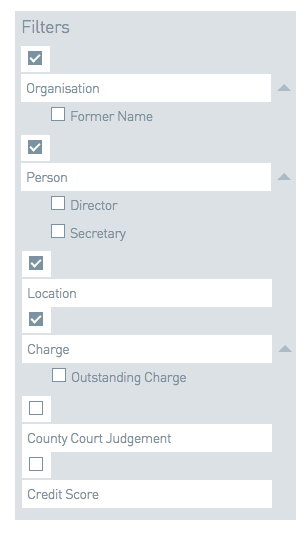 Specifically, you can filter by organization, by person, by location, and by charges/mortgages. Filters dramatically increase productivity when working with a chart. For instance, in just 2 or 3 mouse clicks you can repurpose a chart from a view showing the current directors of a company to a financial view showing just the outstanding charges applying to the same company. So filters serve as a powerful mechanism to de-clutter a chart, by removing from view the information that does not interest you or is not relevant to the investigation at hand. We’re confident the new Filter Panel will accelerate review and make your corporate research easier and faster. We’d love to know what you think.